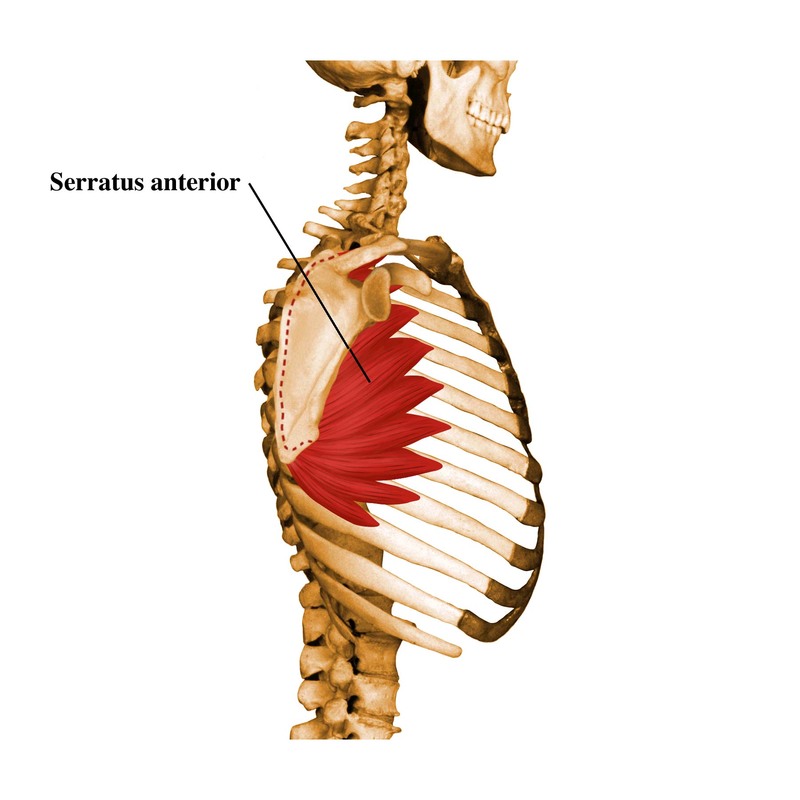 What the heck is the serratus anterior? Because the serratus anterior is largely hidden from view underneath the shoulder blade, it is remarkably easy for both patients and clinicians to forget about this vital muscle. It originates from the underside of the shoulder blade near the inner edge and has a broad attachment to the ribs. It gets its name from the way that it is serrated, like a knife blade, as it attaches into the ribs, and is anterior (forward to) the shoulder blade. Even though the serratus anterior is not visible on most people’s bodies, it is normally a very strong and fairly large muscle. Okay…so what does it do? And here is where the confusion REALLY sets in. The serratus anterior has historically been though of as performing two primary functions. The first is to hold inner edge of the shoulder blade against the ribs, preventing ‘winging’ of the shoulder blade, as shown here. However, winging of this type is fairly rare, occurring mostly with injuries to the nerve that supplies the serratus anterior, the long thoracic nerve. The second commonly thought of function for the serratus anterior is ‘protraction’ of the shoulder blade, pushing it forward relative to the body in a punching motion. So, the reader is thinking at this point, if my serratus anterior is weak then my right hook isn’t what it used to be, and I have a funny looking shoulder blade. Tell me again why this is important? Turns out that the serratus anterior does two other things that are a bit more functionally useful to us. The first is that it is the strongest, best positioned muscle to create upward rotation of the shoulder blade, basically aiming the socket up. In order to reach higher than about shoulder level the shoulder blade must upwardly rotate. If the serratus is weak, then the shoulder blade literally can’t get out of the way of the arm, and that leads to pinching at the top of the shoulder, frequently known as subacromial impingement syndrome or subacromial bursitis. Over time, it can even lead to development of a rotator cuff tear. The other really important function of the serratus is to solidly anchor the shoulder blade to the thorax with use of the arm. If the shoulder blade doesn’t have that stability, then the rotator cuff must work much harder, rather like walking in sand rather than on a hard surface makes your legs work harder. That can, in turn, lead to rotator cuff tendinitis. What does this have to do with my neck pain? The serratus anterior isn’t the only upward rotator of the shoulder blade, it’s just the best one. 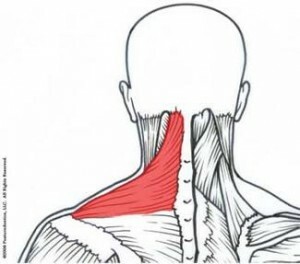 If it’s weak, the body goes looking for another way to accomplish the movement, and the next muscle in line is the upper trapezius. The upper trapezius - look familiar? Unfortunately, the upper trapezius is not particularly good at creating upward rotation of the shoulder blade, so in this role it has to work extremely hard, and so can become quite painful. It also attaches into the skull and upper neck, and so significantly compresses those structures when it is activated. How would I know if my serratus is a problem? Anybody with shoulder pain should certainly have their serratus anterior strength assessed by a physical therapist, as serratus anterior weakness and/or inhibition is extremely common to a range of painful shoulder conditions. The serratus anterior should also be examined for most patients with neck pain, particularly those who find that their pain is brought on by use of their arms – i.e. experiencing neck pain with lifting, carrying, cleaning, etc. Like most muscles, serratus anterior strength is very activity-specific. 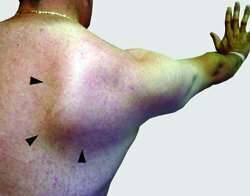 A common pattern is that a patient may be able to generate significant force into protraction – the ‘punching’ motion, but have much less strength with upward rotation of the shoulder blade. And if there is a strong compensatory pattern already in place it can be quite difficult to re-establish a more efficient movement pattern. So, while the internet has many serratus anterior exercises a short Google search away, people with symptoms are best advised to seek the guidance of a physical therapist, who can identify the specific pattern of weakness that may be present and design an individualized exercise program to address it. If you’re in Flagstaff or northern Arizona and want this type of evaluation, then please call us at 928-556-9935 or email us for an appointment! The second subgroup for treating low back pain is stabilization exercise. I find this to be an interesting category in the way it has evolved and what we are finding through research. It is commonly thought that “core training or stabilization” is the best way to treat low back pain, but this isn’t always the case. The literature over the past several years has prompted popularity in the prescription of stabilization exercise, however, results on its true effectiveness are inconclusive. While strong abdominal and back muscles definitely can help prevent and manage low back pain, it isn’t always the correct intervention for someone with low back pain. 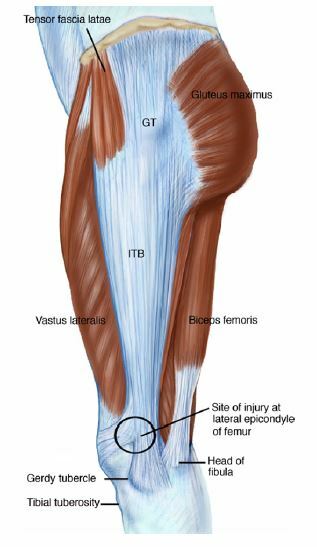 Aberrant movement when actively bending forwards and backwards, referred to as an “instability catch”, and the patient may perform “thigh climbing” when coming up. Is this the right intervention for me? A person who meets at least three of the four criteria is 80% likely to report at least a 50% decrease in symptoms when a core stabilization program targeting both deep and superficial trunk muscles is utilized. What I find even more interesting is that when at least three of these factors are negative, the person is 86% likely to FAIL to improve with a stabilization program. If you currently have back pain and just can’t seem to get better no matter how strong you get, this may shed some light as to why! There is also an additional set of factors to identify women with pain who are postpartum and likely to benefit from a stabilization program. For more information about classifications of low back pain, you can read the article here. Call or e-mail CoreBalance Therapy to schedule an evaluation with a physical therapist so that we can determine the best approach for you! However, the situation does illuminate the fact that there are still many people out there that believe some old wives’ tales about pregnancy and exercises—and, that not everyone posting on internet sites knows much about climbing techniques. Now, don’t get me wrong; there are times, such as higher-risk pregnancies, when exercise should be very carefully monitored, and sometimes restricted. And, there are some women, me included, that simply cannot exercise at all during pregnancy. I could scarcely climb off the couch without vomiting, let alone be in a moving vehicle on the way to climb a big rock. The startling lack of cooperation on the part of my body shattered any pre-pregnant preconceptions I had about being one of those women who would run miles and miles during their glorious, relatively-pain-free pregnancies. The American College of Obstetricians and Gynecologists publishes a working list of guidelines on exercise during pregnancy; it is updated at times based on the most recent studies. Over the past decade, these guidelines have become more broad and general; I’ve summarized them below. For women with normal pregnancies, 30 minutes of moderate exercise daily provides many benefits (this is the same intensity and duration recommended for non-pregnant women). If you’ve been engaged in a certain activity or sport before pregnancy, you probably can continue it during pregnancy (as long as you’re not getting injured, and it’s not a contact sport). You need to avoid lying on your back after the first trimester. Contrary to the serenity suggested by ethereal music and deep breathing in a yoga class, prenatal yoga can actually be very stressful to the maternal joints and ligaments, especially in asymmetrical stances. If you’re not experiencing low back or hip pain, by all means continue your yoga classes! However, if you are getting sharp shooting pains in the low back or buttocks, you may need to significantly alter your routine, or discontinue it altogether. These kinds of pains usually indicate a need for physical therapy intervention. Talk with your physical therapist about your exercise activities during pregnancy for recommendations on how to keep active without causing lasting injury to your body!